When people think about the Mazda brand, one of the things they are going to remember is the design of the vehicles. Fortunately, the Mazda6 keeps the reputation going with its subtle changes to the design of the vehicle which will get people interested in driving it when they first see it. One feature that grabs the attention of people is the front side of the vehicle which includes the grille and fog light. This shows that Mazda is all about function and form. Another feature that is worth looking at is the Nappa leather material of the interior. This adds to the comfort that drivers and passengers get to experience when they are on the road. It also has a nice look to it. Our Ramsey Mazda professionals have a lot of knowledge about vehicles that combine form and function. 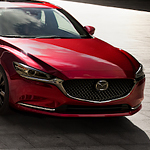 Visit us so that you can test drive the Mazda6.